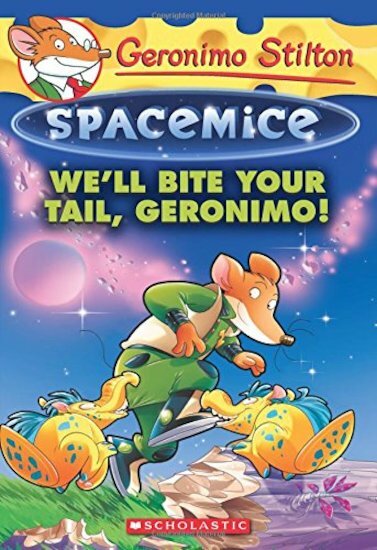 Geronimo Stilton Spacemice #11: We'll Bite Your Tail, Geronimo! Professor Greenfur, the official scientist aboard spaceship MouseStar 1, has changed colour from green to… orange! What’s going on? To find out, the spacemice travel to his home planet of Photosyntheson. It seems that all of Professor Greenfur’s relatives are being threatened by the nibblix: tiny aliens with very sharp teeth! Can the spacemice help out and fix this colour catastrophe?